Heat oven to 400°F. In large bowl, mix pork sausage, onion and salt. Shape mixture into 4 equal patties. Roll each hard-cooked egg in flour to coat; place on sausage patty and shape sausage around egg. Dip each into beaten egg; coat with bread crumbs to cover completely. Place on ungreased cookie sheet. Bake 35 minutes or until sausage is thoroughly cooked and no longer pink near egg. Make a batch of these powerhouse protein-rich eggs; wrap in them in waxed paper and tote them along for a breakfast on the run or to pop into a lunch bag. Keep chilled with a small ice pack or frozen juice box. Warm them a little in a microwave for about 15 seconds. Use bulk Italian sausage and Italian-seasoned panko bread crumbs for a southern European twist. For perfect hard-cooked eggs every time, place them in a small saucepan and just cover them with water. Bring them to a boil; remove from the heat, cover, and let them stand for 10 to 15 minutes (depending on how firm you’d like the egg yolks to be). Scoop the eggs into a large bowl of ice water; let stand until cool enough to peel. You don’t have to go to the pub to indulge in this classic snack beloved in the United Kingdom and served in British-style bars and eateries around the world. Scotch eggs are easy to make at home and make a great appetizer or snack, especially on a picnic. 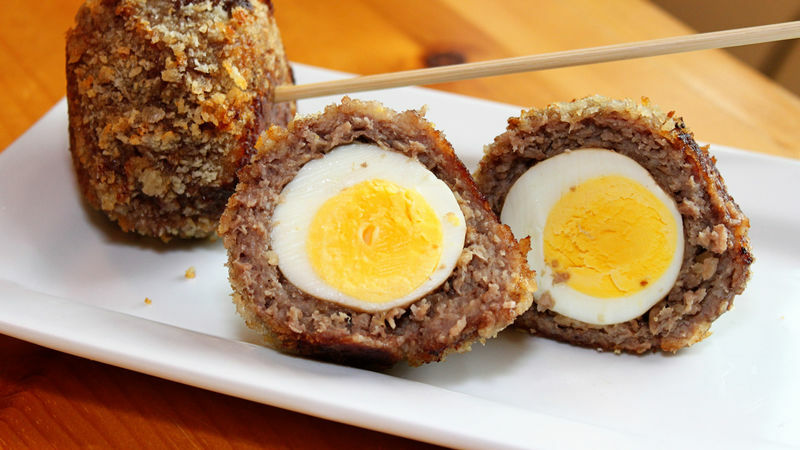 Like many a storied recipe, the history of this one is unclear, but what is clear is that certain ingredients are necessary to make a proper Scotch egg. Typically, these recipes include a hard-boiled egg encased in sausage and bread crumbs and deep-fat fried or baked. With this recipe, you don’t have to deep-fat fry, instead simply bake your Scotch eggs on an ungreased cookie sheet. So why not give it a whirl? We think one of these would go down fine with a crisp ale or hard cider. And if they're really not for you, Betty’s got plenty more impressive appetizer recipes.